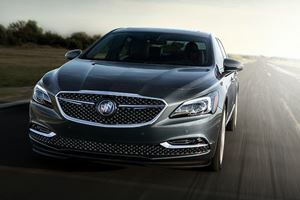 This new incarnation of the Buick LaCrosse is much better than its predecessor and while it’s not quite an all out luxury car like along the lines of a Lexus, it’s certainly worthy of the premium status it carries. Is the car a better option than its sister car, the Chevrolet Impala? That all depends what you want out of a car. Soft leather has been used for the seating and trim panels and where you’d normally find hard plastics you’ll see a similar material but more padded and softer to the touch. Buick has seemingly pulled out all the stops with the LaCrosse sedan. While the exterior dimensions are similar to the Chevrolet Impala, inside the cabin the differences between the two full-size sedans are a lot more noticeable. Space is similar though; there is a lot of it to make the LaCrosse a comfortable cruiser than can comfortably fit the whole family in. As with most newer Buick’s, the interior is much better; soft leather has been used for the seating and trim panels and where you’d normally find hard plastics you’ll see a similar material but more padded and softer to the touch. The power-adjustable front seats look inviting, which should equate to being comfortable and here your eyes don’t deceive you, they’re exactly that with extra lumbar support. The driver’s seat is 8-way power adjustable and the front passenger seat 4-way power adjustable. The controls on the wheel are laid out well and easy to use. Facing the dashboard, you’re greeted with an uncluttered and classy design and the multifunction steering wheel complete with power tilt and telescopic reach fits in well with this design. The controls on the wheel are laid out well and easy to use, they allow the drive to control a host of function on the crystal clear and responsive 8-inch touchscreen. One quirk is the console between the driver and passenger, it looks good but seems a little too high as if there were a transmission tunnel. At least there’s space for a couple of bottles and some everyday carry items. This raised center makes the gear lever feel a bit too high; a rotary selector dial as seen in the Chrysler 200 and the new Lincoln models would have been a much better design and would have freed up a bit of space. Some may not have a problem with this, but if you’re shorter then it might make things a little uncomfortable and the driver closed in somewhat. As for space, the Buick LaCrosse is a full size sedan the big rear seat can fit three average-sized adults with ease. The fold down centre armrest has dual cup holders that will fit a regular water bottle. The trunk is average with space equal to the smaller mid-sixed Buick Regal at 15 cubic feet, but there is still the 60/40 folding seat for more space. The Buick LaCrosse excels at offering a smooth and comfortable drive. As expected from a large and upmarket sedan, the Buick LaCrosse excels at offering a smooth and comfortable drive. This car is a premium people transporter with an almost luxury feel to it. Overall the drive is very composed and you’ll find minimal body roll, which is testament to the quality of the suspension with it being able to keep the large sedan stable. The Buick LaCrosse is fitted with 18-inch wheels as standard. The suspension isn’t hard though; the Buick is able to soak up imperfections in the road, so much so that only the bigger bumps will be noticeable from within the cabin. The Buick LaCrosse is fitted with 18-inch wheels as standard, and these wheels with their bigger sidewall tires also lend to the smooth and comfortable drive. A 3.6-liter six-cylinder gasoline engine. The Buick LaCrosse, the Buick LaCrosse Preferred, the Buick LaCrosse Essence and the Buick LaCrosse Premium all share an identical powerplant:a 3.6-liter six-cylinder gasoline engine that produces 310-hp and 282 lb-ft, which is enough to pull the full size sedan around with relative ease. The front-wheel drive models all use an eight-speed automatic transmission. 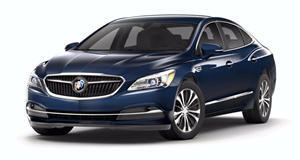 The Buick LaCrosse also sees fitment of the same transmission too besides the top-of-the-range Premium model. The front-wheel drive models all use an eight-speed automatic transmission. Consumption figures are quite good too with the Buick LaCrosse returning figures of not a sports sedan 21 mpg for the city and 31 mpg on the highway – though adding the optional all-wheel drive model (a $3,000 extra on the range-topping ‘Premium’ model) does increase fuel consumption marginally. You’ll find things like Bluetooth streaming, Apple CarPlay, Android Auto, and the aforementioned 8-inch touch screen. The Buick LaCrosse is one of the more upmarket vehicles in this segment, and as such it has given the car a spec and feature list to match the pricetag. You’ll find things like Bluetooth streaming, Apple CarPlay, Android Auto, and the aforementioned 8-inch touch screen. The system is always a pleasure to use, especially since it provides excellent clarity and color contrast and it’s use is quite intuitive. We also find more useful features like wireless charging, satellite radio and built-in navigation..
That’s a good amount of safety and tech. Standard features on the Premium (and can be options on other models) includes an array of 10 airbags, a rear view camera, ultrasonic park assist, forward collision alert, rear cross traffic alert, lane-keep assist and lane change alert with blind spot warning. There’s more to be had if you choose one of the packages like the $1690 Driver Confidence Package that add in features like adaptive cruise control, automatic parking assist, front automatic braking and front pedestrian protection. A Sight & Sound Package adds in items like an 11-speaker surround sound audio system at $1145. Stargazers can option a Sun & Shade package with a large panoramic sunroof at $1550. That’s a good amount of safety and tech. Taking a look at the safety testing by the Insurance Institute for Highway Safety, we see the Buick LaCrosse scores as Good in the moderate overlap front crash test and also the side crash test, but front crash protection was only classed as basic with optional safety equipment. There’s a hefty price tag on the Buick LaCrosse, but is it worth that money over rivals? It’s true that the pricing of the different Buick LaCrosse models seems steep, and compared to many rivals. Even the base models are on the pricier side of this class, and you can walk away with a $50,000+ Buick LaCrosse if you go overboard with the trim levels and option packages If you really want a full size sedan with the new colorful Buick on the front grille, then yes, go for the LaCrosse. If however you want as much as possible crammed into a very similar sedan then you should probably take a closer look at many of the Buick LaCrosse’s less expensive rivals. 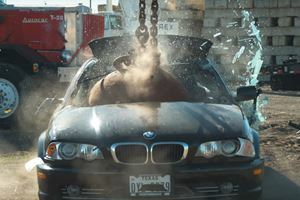 Not just any wrecking ball, but a four-ton wrecking ball. Buick’s new flagship luxury sedan will debut at the LA Auto Show later this month. We can vouch for several on this list.